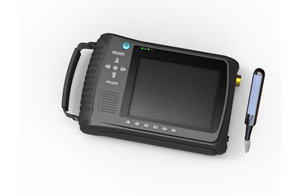 The PL-3018V handheld digital ultrasound scanner is a well-balanced choice for those who require both the value of features of traditional color Doppler ultrasound system and the accessibility without any budget constraint. The USB disk function makes the images easily transferred into computer. Its rechargeable battery could last at least three hours. Due to our remarkable design and success in the ultrasound field, this handheld ultrasound scanner will offer customers amazing image quality and functionality with refreshing experience. Applications abdominal, OB/GYN, urology, cardiology, etc. Xuzhou Palmary Electronics Co., Ltd is a professional manufacturer and supplier of handhelkd digital ultrasound scanners in China. Based on the advanced technologies abroad and at home, our products have passed the certification of CMD, ISO and CE, and our handheld ultrasound scanners have been well received by customers all over the world, such as Syria, Kazakhstan, Kyrgyzstan, India, Pakistan, Iran, Vietnam, and many other countries and districts. If you’re interested in digital ultrasound scanner, please don’t hesitate to contact us.